Setting clear, achievable, challenging, and unwavering (as much as possible given today’s rate of change) measures is critical to employee success. Appropriate measures are also strong motivators because most employees want to excel, and knowing the target helps them self-measure. 1. Involve your employees to enhance their involvement and ownership. Your direct reports are closest to the action and in the best position to provide information on what's possible in their work. 2. Focus on results and not activity – unless the work to be accomplished has not been done before. 3. Drill down into the goal to determine the “One Measure” that clearly determines success. 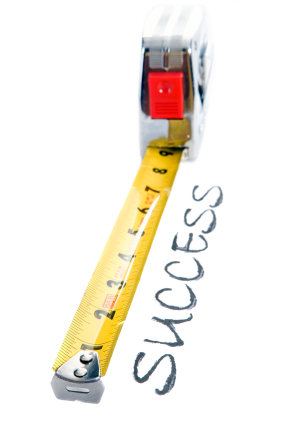 Set a single, discrete measure for each “fundamental” of the business that equates to success. For example In-bound Sales answering each call within 3 rings. 4. Set aspirational targets for “Break-throughs”. For example, reducing cost or time by 20% in a key business process. 5. Examine past data to establish a performance trend or baseline. Then, determine the extent to which the baseline must be altered to meet overall business targets. 6. Consider using a 3-point target. For example, Sears uses their quality measure of Good, Better, and Best. Can you establish levels of performance that will encourage achieving beyond the target? 7. Get your boss's input on metrics to ensure that you are all measuring the same outcomes with the same language, measures and expectations. Your boss may have some helpful suggestions based on his or her experience and understanding of unit and company goals. 8. Consider the employees” or group’s strengths and weaknesses. Determine what targets would encourage strength building that is directly linked to business goals and the individual’s career development aspirations. 9. Examine customer or other stakeholders feedback to determine expectations that aren’t being met. Exercise caution here! Don’t get caught in the trap of giving your customers what they want while your competitors create innovation that the customers are going to need but don’t yet realize. 10. Ensure that targets are clearly aligned with corporate measures and goals so effort is cumulatively productive. 11. Set the standard that employees measure their own progress against targets and report their progress or slippage to you on an agreed-upon time frame. Establish the up-front expectation that when slippage occurs the employee is to report results for the period with a workable and realistic plan to reach the target before the end of the performance period. 12. Provide routine opportunities for employees to review progress. Teach them how to “brag” about their good performance, results achievement, and help them feel a real sense of achievement as they are reporting progress that will enable target accomplishment. 13. Make the rewards worth it. That means you may have to push your boss to permit substantial rewards to be give for phenomenal performance – and then don’t “cheap out” but really deliver. You may have to provide rewards that are counter-culture for the organization. Be sure to determine the employee’s aspirations so you know what rewards will create a real enticement. For example, many employees want barriers to be removed so they can really produce. Others want better computers, a better desk chair. Too many organizations fail to see the value in giving high performers what they want for fear that the employees are going to want a million dollars each. And – maybe an employee that gets enough business to produce a hundred million in profit should get that million! What I have found that has been a tremendous help is allowing my team to be involved in many of the decisions that will affect the company. I like to ask them what do they think is the best thing the company should be working on or towards because I have found that that engages the staff way more and the more people on the team who actually care about what the leader/owner is trying to do the faster and easier it is to get it done. Also knowing exactly what it is you are striving to do is important as well. Right, #1 on the list! Thanks.